I am coral reef ecologist. I am fascinated by the diverse arrays of composition that marine communities can have, and how these communities can drastically change at even small distances. I started my career monitoring Costa Rican coral reefs (Caribbean and Eastern Pacific), and by looking at the variation in the structure of coral reef fish assemblages it was clear to me that patterns of recruitment and population connectivity were key components that led to these incredible variations. I learned that estimating connectivity between populations was useful for the design and management of marine protected areas, so I decided to focus my research in this field, looking at population genetics of reef fishes in the Caribbean and Indo-Pacific (work in progress). Multiple field trips to monitor Costa Rican reefs also taught me that the people that live near these ecosystems are an amazing wealth of knowledge, and that when we work together and share our experience we can take better care of marine ecosystems. These interactions also help scientists come up with research questions that are of key interest to the ecosystem users. Now I have been involved with One People One Reef, an organization that seeks to combine traditional ecological knowledge with western science to manage marine resources that people in Ulithi Atoll (Micronesia) depend on. My research with population connectivity led me to work with reef fish biogeography and evolution, a fascinating field. Currently my career goals are trying “to go back to my roots”, of why I became a marine ecologist. I am now leaning more towards understanding the effects of habitat degradation and climate change on community structure. 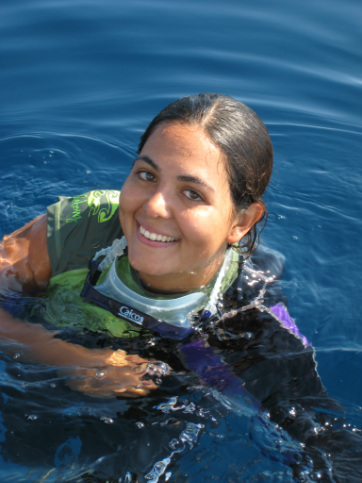 But more importantly, I am looking to tackle research questions that can be directly applied to conservation of marine ecosystems, using the tools I have learned as a coral reef ecologist, my population genomics experience and my experience working in marine conservation NGOs. I also want to work closer with the people that depend on the ecosystems that are the basis of my research. My career is evolving, and right now I am looking for opportunities to achieve these goals. Currently I work as an adjunct instructor at Cabrillo College, and during the summer of 2017 I am thrilled to be leading a youth exchange program to Ulithi atoll! In this program, young students from USA and Micronesia will work together in doing citizen science and will be working with the local communities. I am working with One People One Reef and Bluecology to achieve these fascinating goals. I enjoy doing research, working with people and teaching a whole lot!